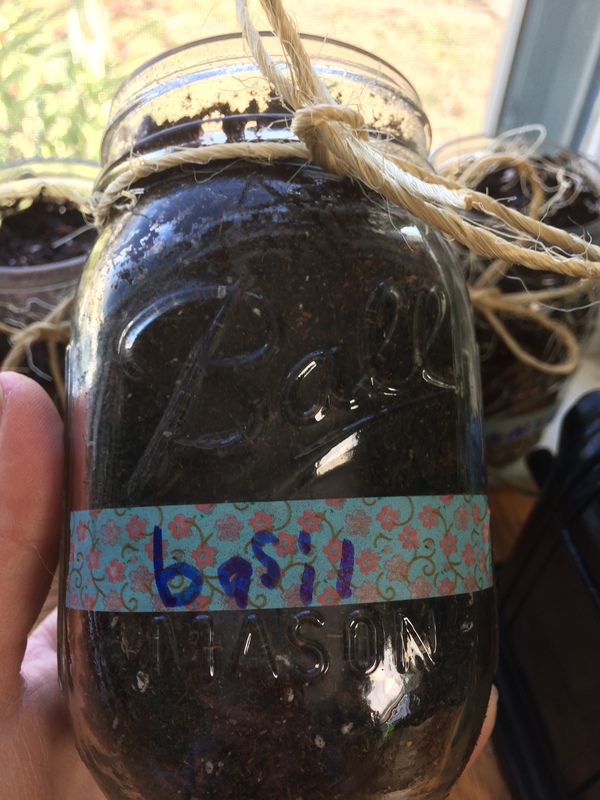 Basil in a Ball Jar: Why Didn’t I Think of This Sooner? It’s no secret that POD’s best ROI comes in the form of its abundant herb garden and that sticker shock at the grocery store is an actual thing come February. Our garden may be tiny, but it’s mighty. Basil in a Ball Jar. Oh, yeah. Not an earth-shattering or a particularly new idea, but duh! Instead of shelling out $8-12 for a kit, the Hurricane and I shook off our frustrations, grabbed a bag of dirt (which, miraculously, they had in stock) hurried home, dusted off a few canning jars, sniffed the Sharpies, and broke open the seeds. Dirt+1/2c water+seeds+sunny sill = 10 days later and we have basil and cilantro seedlings! Huzzah!